This simple Candied Rainbow Citrus Peel recipe transforms your leftover citrus peels into a delectable holiday candy! Give them as a fun homemade gift or chop them up for topping yogurt and cereal for yourself. Use a paring knife to slice just through the peel from the top to the bottom of your citrus, cutting into fourths or eighths, depending on how thick you want your candies to be. Gently peel off the skin (save the fruit for another recipe). Gently scrape off any mushy white bits that may be left on the inside of the peel. In a large pot, combine peels, 2 cups sugar, and 1 cup cold water. Bring to a simmer over medium/high heat, stirring occasionally, until the peels are translucent (about 40 minutes). Use a slotted spoon to remove peels and place them on a wire cooling rack. Let cool and dry overnight. FInish off candied peels by rolling in fine sugar. At this point, you can also dip half of each in chocolate. Store in an airtight container in the fridge for a few months. *The purpose of this process is to remove a lot of the bitterness from the peel. The number of boil/drain repetitions totally depends on your peels (thickness, size), and your taste, but I found 3 to 4 repetitions to be about right. 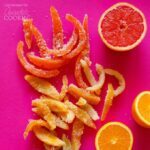 This recipe for Candied Rainbow Citrus Peel was printed from AmandasCookin.com - https://amandascookin.com/candied-citrus-peel/ and can only be printed for education or personal use.